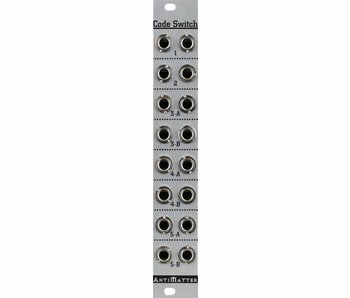 Launch Codes is a compact modular performance source for manual or sequenced triggering and gating for up to five separate events. Real-time manual performance switch controller providing trigger, momentary gate, or latched/toggle gate voltage outputs, selectable per each of the five channels. Clocked performance sequencer for five trigger/gate events. It will record button presses and play them back quantized to the clock input. Sequences are up to 32 steps long, times 5 patterns, for a total of 160 steps (10 bars). Generate allows you to play with generating alternative versions of your sequence. Each sequence channel has controls for performance muting. Patterns can be expressively chained in the order pressed (3-2-4, 4-1-5, etc...). Launch Codes will continually loop through this chain, or a single pattern.